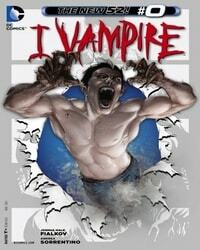 I, Vampire Average 0.00/5 - out of 0 total votes. In 1591, after being turned into a vampire himself, Lord Andrew Bennett turned his lover, Mary Seward, into a vampire, and she became corrupted by the power. She took the name Mary, Queen of Blood and created a group of vampires called The Blood Red Moon bent on taking over the world. The series followed Bennett into the modern day as he tried to undo his mistake and take down Mary and The Blood Red Moon. He was helped by his two companions Deborah Dancer, a beautiful young woman who Bennett saved from Mary at Woodstock (and was also his girlfriend) and Dmitri Mishkin, a Russian man whom Bennett rescued from Mary (and his own mother, turned by Mary) when Mishkin was a child. To try and keep his humanity, Bennett made a vow to only drink the blood of animals and bottled human blood (which created a subtext of alcoholism). In the original series, Bennett keeps his companions at arm's length, particularly Dancer. For a time he stays away from them altogether for fear of putting them in danger. Storylines included Mishkin's quest to find and destroy the vampire who was his mother, Bennett's pursuit of Mary through time periods leading back to a time before either of them were vampires (motivated on Mary's part by a desire to escape a strange sickness killing vampires in the present), and finally an experimental 'cure' for vampirism which leads to the final confrontation between the surviving protagonists and Mary.